Tofu is soy milk curded with nigari. But some other products not based on soy milk are called tofu because of their texture and appearance. Tofu ? dofu ? toufu ? doufu ? The only proper spelling is 豆腐. It’s a matter of transcription. The “t” tends to become a “d” in second part of words in Japanese. And in Chinese it’s written “d” and you read “t”. And the “o” is long. There are huge differences of quality. It can be delicious or absolutely terrible. I wouldn’t want to eat again in this life time all the weirdly packaged tofus I have eaten in Europe and North-America. Maybe I had bad luck. Also in the US, the soy is GMO. The second thing is you have to buy the right type. Both are soft and watery. The first is very soft like egg pudding, the second is soft like starch pudding. Really firm and dry tofu, the one that has a texture closer to meat is popular in China. It’s uncommon in Japan, except in Okinawa, were Japanese and Chinese traditions cross their path. So here it is called 島豆腐 shima tofu, “island tofu“, and in Osaka, I have to buy in “ethnic stores”. The 3 are made with different recipes. 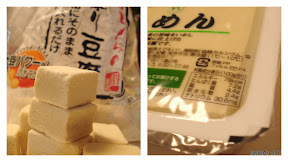 Bottom line : If you like soft tofu, buy it from a Japanese maker (well, a maker making ingredients for Japanese cuisine as of course it’s not a question of nationality). If you like firm tofu, buy it from a Chinese or an Okinawan maker. Other Asian countries tend to make the firm varieties traditionally. Tofu can also be an ingredient for desserts. Posted on July 13, 2011 by My	• This entry was posted in Archive Menus, Avec la recette, Home-made Fait-Maison, Ingredients, Japan/ cuisine japonaise, slow food, Uncategorized, vegan, vegetarian, With recipe and tagged abura age, age-dofu, agedashi tofu, agedofu, boiled tofu, champloo, champuru, chick pea, chigae, dal, doufu, dry tofu, edamame, egg tofu, emamame tofu, freeze dry, frozen tofu, goma, gomadofu, healthy, inari, inari sushi, Japanese, jiggae, Korean, Koya, koya tofu, koyadofu, mabo tofu, nigari, okara, Okinawa, protein, sesame, Shan tofu, soy, soy milk, tamago, tamagodofu, tofu, tonyu, toriri, toufu, tounyuu, unohana, usu age, yellow tofu, yuba, yudofu, zaru tofu, zarudofu. Bookmark the permalink. Stunning pictures….as usual! I’m new to tofu, but enjoy exploring it!